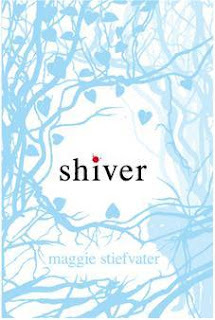 Shiver by Maggie Stiefvater, Review + Giveaway! As I was packing for BEA, I said to DH, "Oh, and I still have to pick out which books I'm taking." He let out a bark of laughter and put his hand on my shoulder pityingly. "You do realize you'll be coming home with a box of books, right? You do not need to take books to the Book Expo. They will come to you," he said in soothing tones. And so after much debate, I allowed myself one book to get me there. There really wasn't any doubt as to which book it would be. A copy of Shiver had shown up in my mailbox shortly before and I was fairly itching to dive in. At the edge of the woods in Mercy Falls, Grace lives alone. Oh, her parents are there but nigh unto incapable. Wrapped up in themselves and their careers, they are aggravatingly oblivious, managing to check in with their seventeen-year-old daughter in the unlikely event it occurs to them. And since she's never known any different, and they are her parents, the eminently practical Grace made her peace with it a long time ago. She doesn't weep over lost chances. She just makes dinner, does her homework, and quietly obsesses about the wolves in the woods. Yeah, Grace has one thing that consumes her. One messy, inexplicable fact in her otherwise staid existence. When she was a child she was mauled by wolves and left for dead. Somehow she survived and, ever since, a solitary wolf watches her from the shadows. Every winter, like clockwork, he skirts the edges of her home like a silent guardian, only to disappear again when summer arrives and temperatures rise. His presence is the one constant in her life. Until someone else is mauled by wolves. Until a boy named Sam turns up on her back porch. A boy with strangely familiar yellow eyes. And the world begins to change. I picked the right book to take with me. As soon as I found out Maggie Stiefvater was writing a new series to do with werewolves, I began counting down the days. Lament was on my Best of 2008 list, and I was relying on the mysteriously titled Shiver to tide me over until the release of the sequel Ballad. And honestly the first thought I had after finishing was that it was perfectly titled because Grace and Sam's story sends shivers down your spine repeatedly. The second thought was how the characters surprised me--in a good way. I don't know exactly what I was expecting. Probably something along the lines of Dee and Luke in Lament, all urgent and angsty and dangerous as hell. But Grace and Sam are an entirely different breed. She is cool and methodical and even and I warmed up to her as I got to know her better. He is warm and thoughtful and artistic and I liked him right from the start. On the paranormal scale, this one falls much heavier on the realistic end of the spectrum. There's even a scientific (sort of) explanation for the werewolves' condition, with the result that the emphasis remains on the characters themselves. They and their storyline are so tied to the seasons, to the minutest fall in temperature, that I discovered I was responding to them in the same way. I loved how contained they both were. Maggie Stiefvater has managed to craft an intensely involving, desperate love story without the cliche teen stupidity a la Romeo & Juliet. Quite the feat. The descriptions are lovely, the young protagonists sympathetic, and there's a scene in a candy shop that will leave you absolutely salivating. I dare you to read that one just once. And now for the giveaway. Because I enjoyed it so much (and because I was able to snag an extra copy at BEA), I'm giving away a signed ARC of Shiver to one commenter. All you have to do is tell me the last book you read that literally sent shivers down your spine and you'll be entered. This contest is open to U.S. and Canada residents only. Open till Sunday the 14th at midnight and I'll announce the winner on Monday. Last book that gave me shivers? The Forest of Hands and Teeth. So delightfully creepy. "Brave New World" by Aldous Huxley. For some reason the descriptions of the gestating clinic really creeped me out when I recently reread it. I don't remember feeling like that the first time through in high school. I can't wait to read this! Picked up a signed copy at BEA too, and so giving away my unsigned copy on my blog (which means, don't enter me in your contest of course!). Is this contest open for relatives? The last book that gave me shivers would be Shadow Kiss by Richelle Mead. Last book that gave me shivers? Bird by Rita Murphy. Lovely, subtly menacing atmosphere in that one. And simply beautifully written. And Farley! YES! I love authors who have more than one type of novel up their sleeve! I'm still super jealous you went to BEA, but since you're spreading the love I can't complain too much. Okay, for the last book that sent shivers up my spine has to be 'The Historian' by Kostova. All I can say is I've learned my lesson not to read Dracula books by myself, at night, during a storm. Cliche, but true. I didn't sleep all night - could be because it was like 1,000 pages long but mostly due to the delicious story. Honestly? Infidel by Ayaan Hirsi Ali, the book I'm reading right now, has one scene that literally had me shaking, aka shivering. What a cool question to match the book title! :) The Stand by Stephen King made me shiver repeatedly, more in a sense of "Don't do that! "-sort of way! Your references to BEA make me so wish I could have gone!!! It's so weird. My husband did the same thing to me when I was wondering what book I should take on the train ride down. Oh, contest. Um. I guess Lili St. Crows Strange Angels - I was a bit scared at one part. The last book that gave me shivers was The Forest of Hands and Teeth. I can't wait to read Shiver,thanks for the opportunity to win a copy. I haven't had much luck with creepy books lately, but the most recent one I can remember is Kim Newman's Anno Dracula, which is about what might have happened to England if Dracula had ended differently. Although I didn't love it, it definitely had the creep factor. Well, rats. I don't think I've recently read anything that send shivers down my spine. OK, I do really want this one. I'm going to have to go with The Forest of Hands and Teeth, too. Janssen, it is terrific! And it was so fun to go find Maggie two hours after finishing it and tell her how much I loved it. RachelG, absolutely. The same scene gave me the hibbity jibbies. Brrr. Lenore, it's SHIVER giveaway week! Can't wait to hear what you think of it. Jennie, it is indeed open to all and sundry. I've never read any Mead, though I've heard lots of good things. Chelle, I think I kind of do know how much you want it. I read your review of BIRD and it sounded lovely. Michelle, I know. It's so awesome to see them do something totally different but still awesome. And I felt the same way about THE HISTORIAN. Such a creeperific story. Rachel, sounds scary. You have a lovely blog, btw! mjmbecky, DH is trying to get me to read THE STAND as my next and 2nd ever Stephen King book. I'm still trying to recover from IT. Even though I loved it to bits. Janice, husbands...they can totally miss the point sometimes. What did you think of STRANGE ANGELS overall. I've got it in my stack but it seems as though response to that one has been uneven. elaing8, no problem. I love passing on a good yarn. deety, I love the what if this happened instead stories. Glad to hear that one was good. Beth, I picked up THE FOREST OF HANDS AND TEETH and only got a few pages in before putting it down because it seemed like a rehash of The Village. Could have been just my mood, tho. Jen, it's starting to sound more and more like I need to give FOREST OF HANDS AND TEETH another shot. Thanks for the push. Sheesh. I don't think I read books that cause shivers. Perhaps that needs to be remedied. I'm reading Afraid by Jack Kilborn its giving me shivers! The last book that gave me shivers was probably Bad Girls Don't Die. I didn't love it, but it definitely had a spooky atmosphere. The last book that gave me shivers was Unwind by Neal Shusterman. I just finished an ARC of Strange Angels, that made me shiver several times. Have you read it yet? It's quite the ride...all I can say are zombies and werewolves...not in a good way. The last book that gave me shivers was Skeleton Creek by Patrick Carman. It was the online videos that got me. LOL! I don't read a lot of creepy books, but I remember the last one that really made my shiver all the way down to my bones was Neil Gaiman's Neverwhere. You review makes me totally want to read this. I don't normally read too many things that scare me, because I'm a wimp, but Leck from Graceling gives me the creeps. For me it would be THE FOREST OF HANDS & TEETH by Carrie Ryan. Excellent book and hard to forget. Though the last book I've finished that gave me shivers (and not in a good way) was Neal Shusterman's Unwind. That story had quite possibly one of the scariest scenes I've read in a very long time. The details are scarce, and it's actually your imagination that becomes your own worst enemy! Crazy, but great! Great review, BTW, and thanks for the giveaway!! The last book that gave me shivers was Midnight Blue by Nancy A. Collins. An older series of hers that she wrote in the 80's. Absolutly amazing book. Sara, you're not the first to mention UNWIND. I may need to look that one up. Holly, NEVERWHERE is in my TBR stack. I keep meaning to pick it up. Samantha R, you're welcome and your comments cements it. Must pick up FOREST OF HANDS AND TEETH and UNWIND posthaste. jennilovevirgo, consider yourself entered. And thanks for following! I haven't heard of MIDNIGHT BLUE but it looks intensely creepy indeed. Sounds like a good contest to me. I'll throw my name in the hat. The last book to get a real shiver from me would have to be Bram Stoker's "Dracula". I read it for the first time last week--can't imagine why I left it on the shelf for so long. Creepy as heck, in spite of the dated writing. Well, as usual I can't remember the name of the one that I thought was creepy. So the one that jumped off the shelf at me was "The Thief of Always". Ha Ha I just remembered the first book..."In Cold Blood". Both disturbing in different ways. I haven't read either in a long time so I don't remember details. The latter however is the kind to give nightmares. ugh! Rabid Fox, I know exactly what you mean. I waited too long to read DRACULA as well and it was so much better than I imagined it would be. Thanks for the link! The most recent book to cause me to get the shivers was 'Afraid' by Jack Kilborn. Found you through the Bookworms Carnival. Lucky you with the copy of Shiver! Nice review too. Jacqueline C, glad you found your way here. And thank you. I hope you get to read SHIVER at some point. The last book that gave me shivers was "Thunderhead" by Douglas Preston and Lincoln Child (it gave me shivers the first time too). The Takers by R. W. Ridley literally sent chills down my spine. I read it like around late night/early morning. You might not want to take my word for it, because I'm a coward. The book did frighten me though. It was a really good read. Highly recommend it. Got mixed up for a while. Do you mean Friday the 14th? The weirdest book ever. It gave me shivers, but not nightmares.